If I bully Fido, Fido will bully others. Popular religious thought seems to agree with this concept (“Do unto others . . .”), as do popular parenting theory and our criminal law framework. So why are so many of us still bullying our dogs? 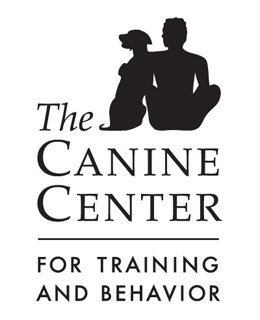 A friend recently shared with me an article about a 2009 study published in the Journal of Applied Animal Behavior Science concerning the outcomes associated with confrontational and non-confrontational behavior modification techniques in dog training. 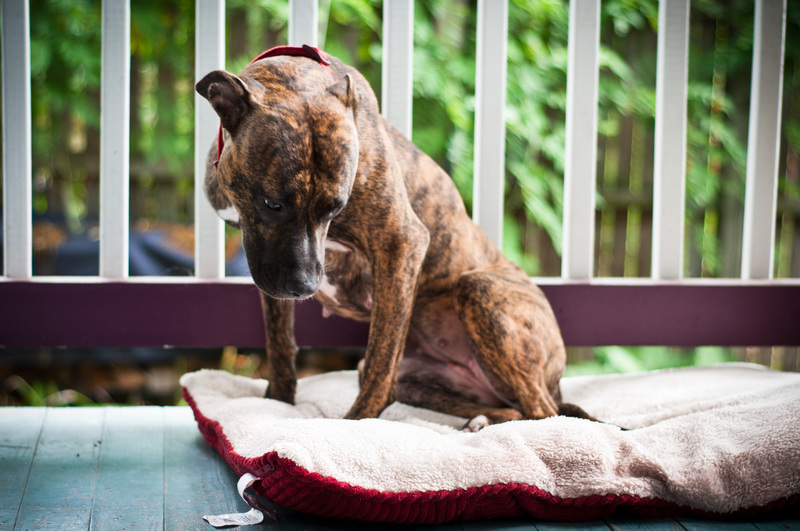 The study surveyed 140 dog owners seeking the help of a veterinary behaviorist, asking what methods they had attempted to improve the problem behavior in the past and what the result of these methods had been. In summary, the study found that the more confrontational tactics — jerking the collar, yelling “NO!” at a dog, performing an “alpha roll,” and squirting the dog in the face with a squirt bottle — were more likely to trigger aggression than non-confrontational tactics. It seems that the big myth floating around that continues to support bully behavior toward dogs is that behavioral problems are the result of a dominance imbalance between owner and dog, and only by properly dominating a dog can an owner regain the dog’s respect, and consequently, good behavior. 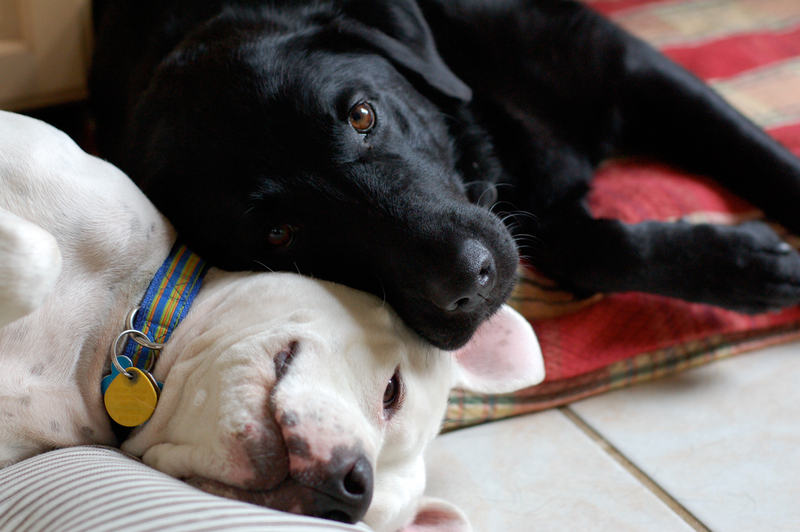 Science has proven that the overwhelming majority of aggression in dogs stems from fear and related anxiety problems. When we treat fear by creating more fear, we aren’t solving anything at all. Only by addressing the underlying fear and teaching a dog to change its mind can we change the undesirable behavior in a reliable way. 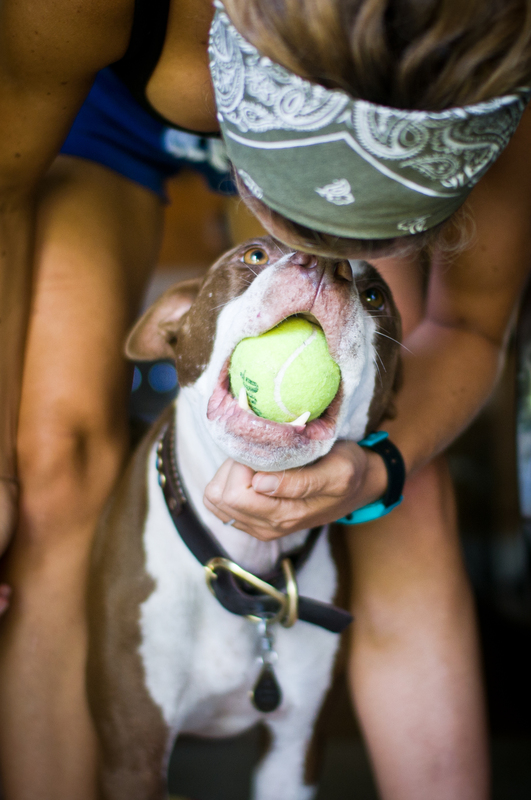 Fear-based training — intimidating a dog into suppressing a fear response — may change the outward response in the moment, but doesn’t address the root issue itself. Makes sense, right? But there’s more: research has also shown that dogs that are trained using only positive reinforcement are less likely to develop future behavior problems, while those that are trained using punishment are more likely to develop fear-related responses to other things in the future. So by using intimidation tactics to treat behavioral challenges, we might not only be eliciting aggressive responses, but also setting ourselves up for future failure, too. Quite the icing on the cake. When we choose to employ a training program in which we jab our dogs in the neck, reach for the spray bottle, or jerk them by the collar, we are building a relationship of intimidation with our dog. We are telling it: “Do what I want, or else.” But if the dog improves its behavior, we have to wonder — have we fixed the underlying issue, or have we created a scenario in which our dog is simply too afraid of what we as owners are going to do in order to act upon its instincts? I’m not sure about you, but this isn’t the kind of relationship I want to have with my dogs. In contrast, when we use rewards-based training to lessen undesirable behaviors, we are saying to the dog “Here’s what I’d like you to do instead, and I will reward you handsomely.” It has a nicer ring to it. 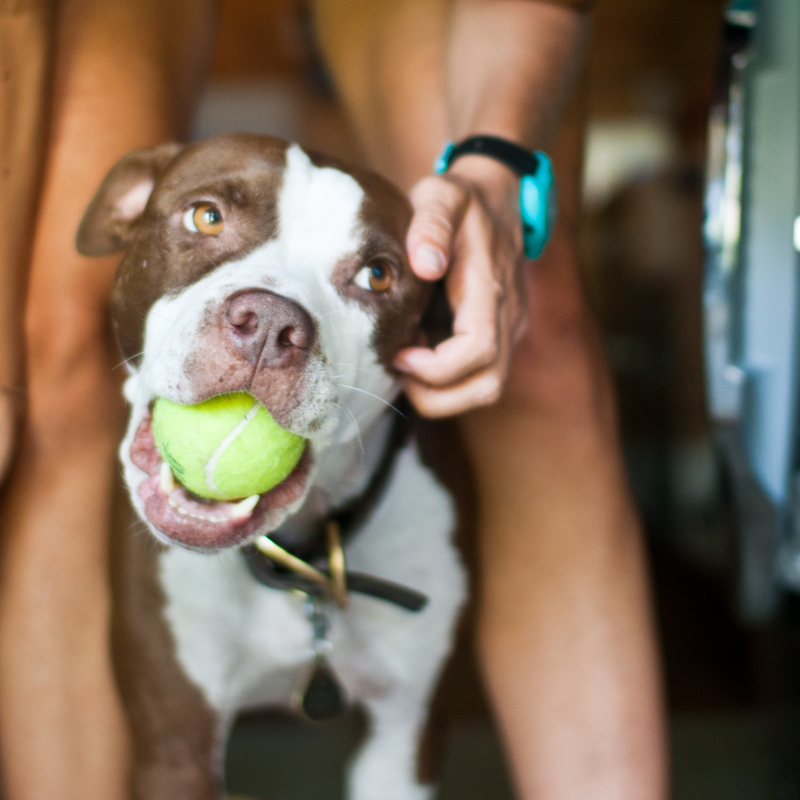 And when we combine the rewards approach with relationship-based training — in which our dog learns that we are fun, gentle, trustworthy, and will keep them safe in all situations — we can start to see real progress, real fast. 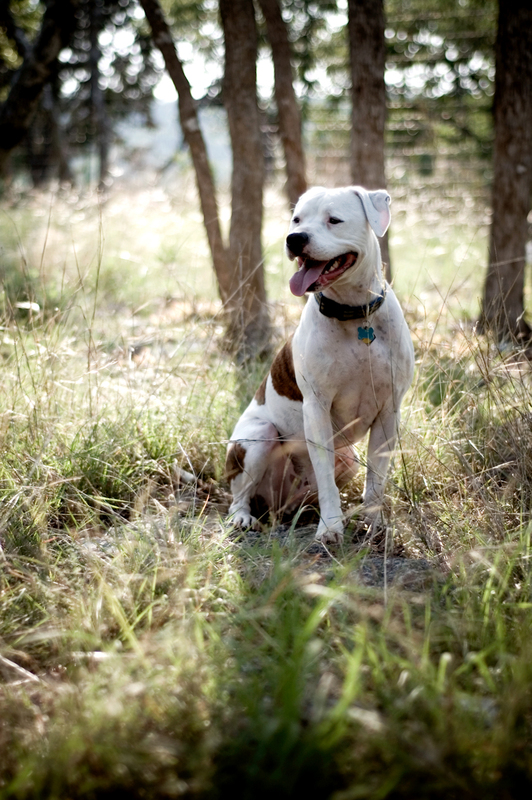 When Chick was much younger, he had some scary run-ins with off-leash dogs, and for years afterward, he lived in constant fear of being attacked. In Chick’s case, the fear manifested itself as stiffening, staring, growling, lunging, barking, and jumping on leash when other dogs were around. Confident of our ability to “fix” Chick’s behavior, we yelled and barked right along with him, jerked him by the collar with all our might, and searched pet stores for more imposing leash-walking tools to really show him who’s boss. We didn’t realize it at the time, but we were essentially telling him: “You’re scared of that? Well you’d better be even more scared of us!” Our intimidation tactics did occasionally stop his tantrums in the moment, but the whole while, we were shocked that he didn’t automatically learn how to relax. Eventually, Chick became so dog-aggressive that we gave up our methods and went to see a real trainer. We threw away our pinch collar that day, and never looked back. 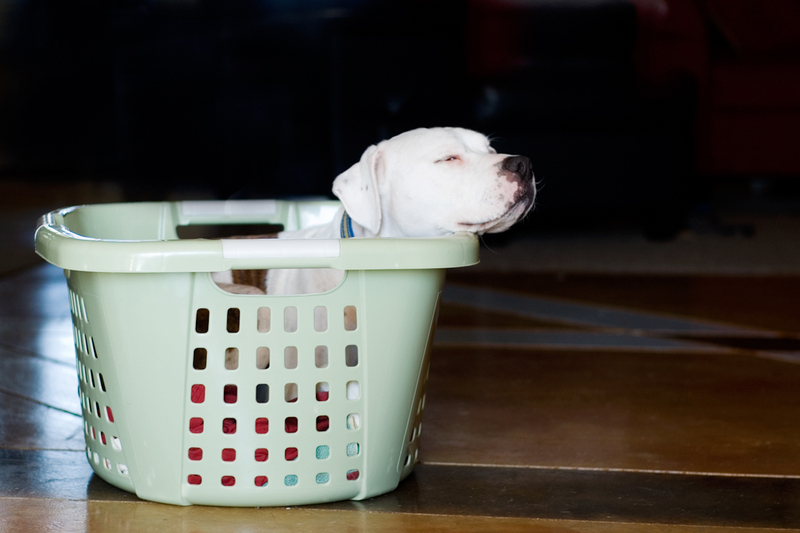 Rather than hollering and physically hurting our dog, we learned to earn his focus in all situations, and how to help him relax in moments of uncertainty. It took hours and hours of practice and months — maybe years — to undo all of the fear we had created. And still there are times — if an off-leash dog comes flying right up to his face — that Chick can lose his cool. But with hard work and positive, relationship-based training, we’ve helped Chick become a dog who can go anywhere, and helped ourselves become the people he can trust, no matter what. For the full text of the 2009 study, click here. Mama had a dream on Wednesday night that I took the Canine Good Citizen test and passed it, so on Thursday morning, she decided: why not? 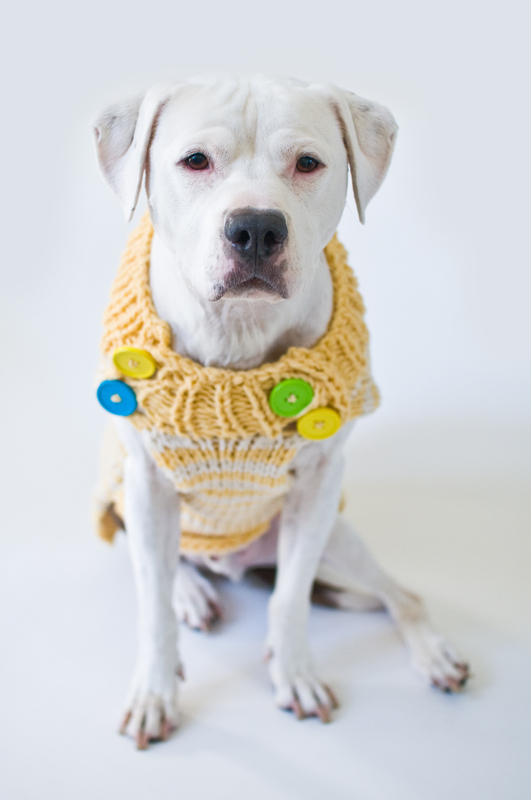 When we got to work yesterday, we were lucky to find that Aunt J — a CGC evaluator — was there! So we went about our business, doing our work, and then when the time seemed right, we slipped outside to have a go at the test. I’ve gotta tell you, I was feeling pretty good. Mama had had the dream, and Uncle C told mama that he thought I was “perfect,” so I went out there with a little spring in my step. Mama emptied all the treats out of her pockets (one of the rules), and we got started. The sit and the down? Piece of cake. I basically sleep-sat and sleep-downed my way through those. The sit/stay where mama walked away was fine, I just patiently waited and did my blinky Chick eyes at mama and Aunt J. The recall was a breeze too. I love running to mama, because she always talks to me in that happy voice and gives me the best pettings ever when I get to her. Then it was time for the loose leash walk. Aunt J told us where to go — head that way, turn left at the grill, then go straight and turn around the stump, make a right turn, then come back. What a joke, right? I am a prize-winning loose leash walker. But oops. I got over there by the grill and the stump, and I couldn’t help but notice the scrumptious little pile of rabbit pellets on the ground, and even though mama called me away and I stayed in a loose leash, I got kind of discombobulated. I blame the rabbit. I rounded that turn, and I felt kind of light-headed. High from the wonderful smell of the rabbit poo. My manners got away from me, and when I sniffed some pee in a clump of grass, I did it: I lifted one of my legs and I peed too. Turns out that peeing during one of the test items is an automatic no-pass. Well when I found that out I was so mad at that little rabbit that I shook my fist at him. Darn rabbit! Nevertheless, Aunt J suggested that we do the rest of the test anyway, since it’s good practice and all, and so I could brag that I would have passed it except for the rabbit’s evil doings. So we continued. Next was the part where Aunt J runs around acting all crazy, throwing buckets and walking crooked with a cane, and I have to shake it off like it’s nothing. Well that was easy because it was nothing but silly Aunt J. Then, some of the other people came outside to make a crowd, and I had to walk in between them while they were wandering around mumbling nonsense. I think I heard somebody saying “Peas and carrots, carrots and peas.” Totally silly, right? So, that one was easy too. Then we got to the dog-dog meeting part. A few years ago, mama would have thought I could NEVER do that part right, but boy oh boy did I ace it. Let me tell you how muchly! Aunt J got a silly young Catahoula who is supposed to be a CGC herself, and we began. The idea is that me and mama and the other person and dog approach each other. Everybody stops, and me and the other dog aren’t allowed to pay each other any mind. Mama and the other person shake hands, exchange “Hi, how are yous,” and we go on about our business. Well you will never guess what happened. We got to each other, and I sat there like the perfect gentleman that I am, and the Catahoula sprang through the air right at me to say hello! I mean, I know I am the most handsome Chick of all Chicks, but come on girlfriend, where are your CGC manners? I was horrified! But being the gentleman that I am, I kept my horror to myself, and continued to sit there like a perfect mister. We did another pass, and this time the silly girl got it right (probably because I had reminded her how). Another ace in my pocket. The last item was called a supervised separation. It means mama goes away and I get to stay outside wooing pretty Aunt J and asking her for pettings. I don’t even get why that’s a test item. It’s more like a prize if you ask me! Obviously, I rocked and rolled that one big-time. So there you have it! A bittersweet win/loss. Aunt J said I totally aced every item on the test, except for the peeing no-no. So mama and I went home and had ourselves some dessert, and dreamt of future tests. With no evil rabbits. Last week on our facebook page, we posted a photo of Doodlebug holding a tennis ball, and asked folks why they thought it might be useful to teach a dog to hold a toy. We were amazed at how many thoughtful, creative ideas everyone came up with! In Doodlebug’s basic obedience class, our homework one week was to only pay attention to our dog when he was holding a toy in his mouth. If he came seeking affection, we were to offer a toy. If he took the toy, we could pet him and play with him for as long as he wanted. But the second he dropped the toy, we lost all interest and the toy disappeared. We stashed toys in all corners of the house, and took our assignment very seriously. 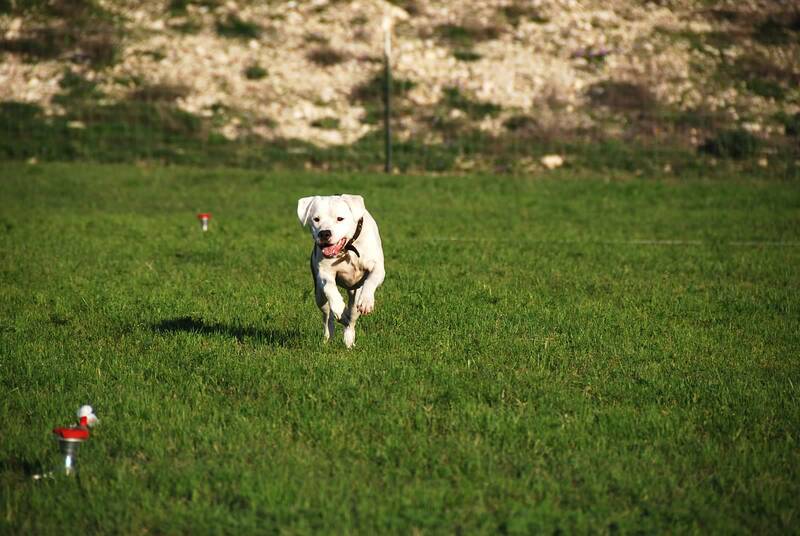 We wanted to work on Dude’s play drive — he didn’t have much interest in playing fetch, chase, tug, or other toy games. 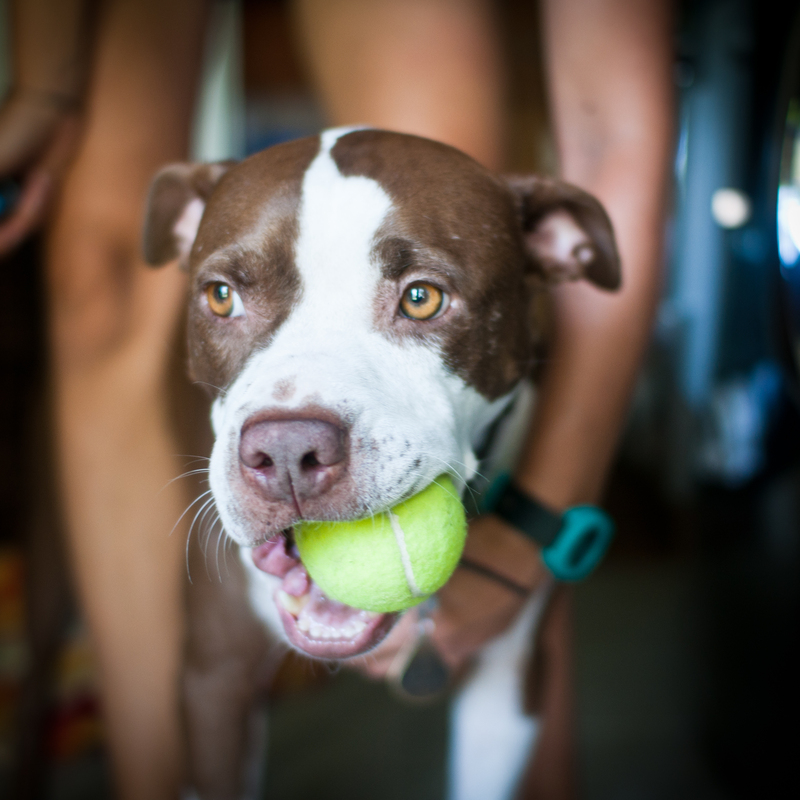 If we could teach him to develop warm, fuzzy feelings about holding a toy in his mouth while hanging out with us, we were well on our way — our hope was that his urge would be to find toys and bring them to us, which is — essentially — fetch. Some of our clever facebook readers guessed this reason right away: “Holding something in their mouth without chewing it is step 1 of shaping item retrieval behavior.” We also learned in class that petting a dog who is holding a toy promotes sharing rather than guarding behavior — “If I bring my treasure to you, you will love on me, not take it away.” A worthy lesson for sure! Our Facebook fans also came up with many of the other great reasons a handler may want to teach a dog to hold a toy. Here are some highlights. I trained my Lilly to play with a ball in her mouth when she was a puppy, so she’d stop chomping on her sister Abby. Luna learned early on to pick up a toy when people came in the door, as it kept her out of trouble as she can’t “love bite” when she has a toy in her mouth. That way she can still be excited but it’s a better way for her to use her toy. I worked with a dog who had a mild case of PICA and at home he loved to carry toys and his bowl in his mouth so we worked on teaching the dog to carry a ball or a bone on walks to help prevent him from eating every little thing he wasn’t supposed to. My friend’s dog had anxiety issues when people left the house. He physically displaced by biting shoes pant legs etc. 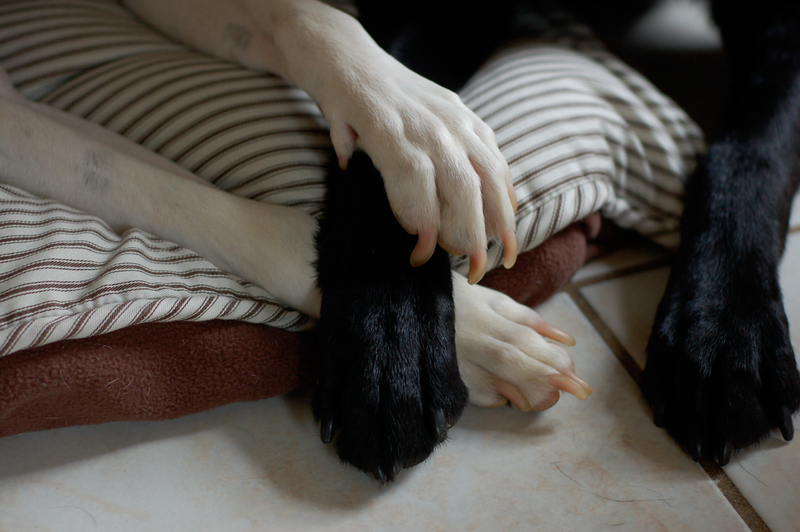 She taught him to find and hold a toy to keep him from biting; over time it seemed to help lessen his anxiety. We’ve trained our pooch to “hold” something when we roughhouse. She doesn’t attempt to bite, but having her mouth closed around something prevents any accidental teeth-skin contact. It’s like they have a “job” to do, something to stay focused on when out for walks rather than worrying about the passing dog or person. Holding a ball in her mouth seems to make Harley a little less anxious. Not sure what the mechanism is here, but maybe like a human stress ball, it gives her something to let out a little crazy and focus on. Helps my girl Nina when we’re walking the neighborhood and she sees a dog that she would normally want to spark off at. Since she’s determined not to let go of her ball until she gets home, she doesn’t bark. Both of mine know the “hold” command, kinda important when they are retrieving birds for us. We also like to make it into a game where we get them to carry things between the two of us. VERY handy when one is outside and needs something from inside. They get to be the messengers. Have you taught a dog to hold a toy? If so, how, and for what reason? Mama used to walk me on a prong collar and a retractable leash. She would let me run wild, hit the end of the line, and correct myself with those icky metal prongs poking into my neck. She had no idea how to control me, and it never occurred to me that a retractable leash + prong collar combo was not a good choice. Before we went to see a quality trainer, the combo and the leash jerking that was “teaching” me how to not pull had rubbed most of the beautiful white furs off the front of my neck. My best friend and uncle, Tex? He is from a breeder. Yep, that’s right. Mama, my grandparents, and my aunt Kareaux decided they wanted a dog 10 years ago, so they did what they knew was the best way to get a good dog — they researched breeders, found a good one, and bought a puppy. A beautiful, 8-week-old black lab from working lines named Tex. For years and years, mama never clipped my nails. Never, ever, ever, until they were so long that they making my toes kind of squoosh to the side when I walked and ran. I didn’t like having my nails clipped, so mama didn’t clip them. It was not pretty! 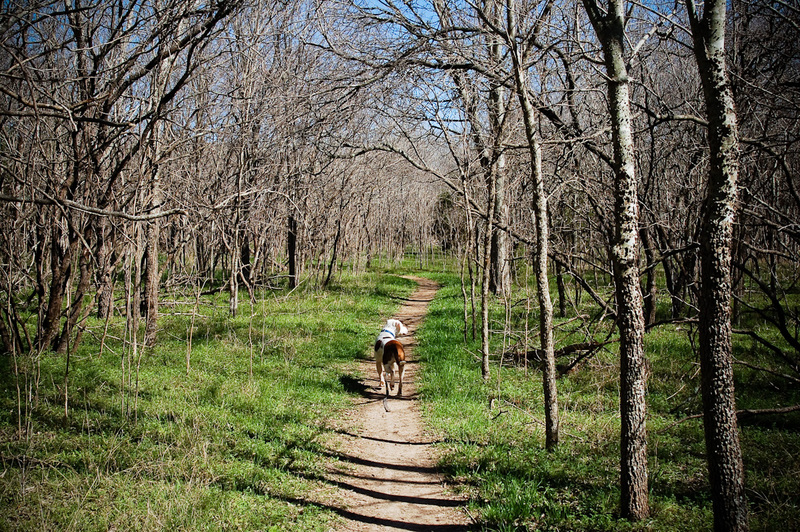 Mama used to let me hike off leash illegally, even though I am not always totally reliable when she calls me. She would let me run around, eat deer poo, sniff other hikers and bark at their dogs, and then get annoyed when people gave her dirty looks or yelled at her to put me on my leash. Mama once carelessly left me and my Tex at home together with some kongs stuffed with the yummiest snacks you can imagine, and we got into a scuffle when she was not at home, even though we are best friends. Mama not only broke the golden rule about not leaving dogs unsupervised with prized resources, but she didn’t even know about the rule. Mama used to make broad generalizations about me and other dogs who look like me, even though she didn’t really know for sure. She would say things about how we have more jaw strength than other dogs and can’t feel pain, and say that she thought maybe I was a bait dog before she adopted me. And yet — despite all these confessions — most people would call now mama a relatively good, responsible dog-lover. How many of us have judged her — or somebody committing one of these confessions — in the past? 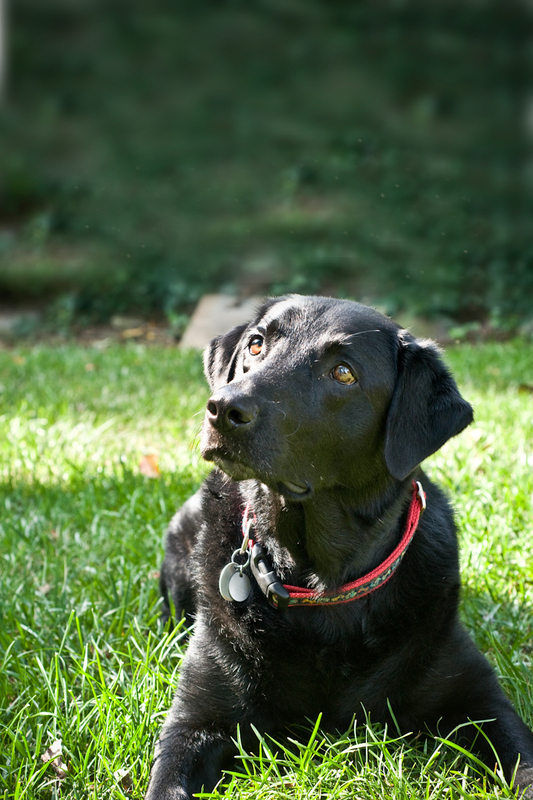 It’s so easy to judge another person or dog based on a snapshot — a single story, a random encounter, a bit of gossip. It’s much harder to do the humane thing and reserve judgment. We are all in different points along our journeys, and it is human — and canine — to learn at our own pace and make mistakes along the way. So why not try a little gentleness on this fine, summer Friday? Yesterday me and my Doodlebug went agilidoggin’ for the second week in a row, and holy moly was it agili-licious! Mama signed us up for an intro-duck-shun class with her and dad, saying something about how it would be good for our confidence and working around other dogs or something like that. 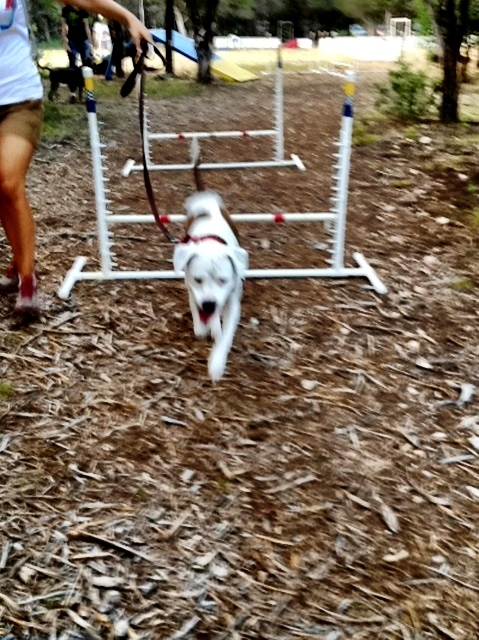 Mama says that agility is a good job for dogs who are nervous because it lets them focus on something other than their scarediness and have fun even though they are a little bit worried about the other dogs. And you know what? It’s true! 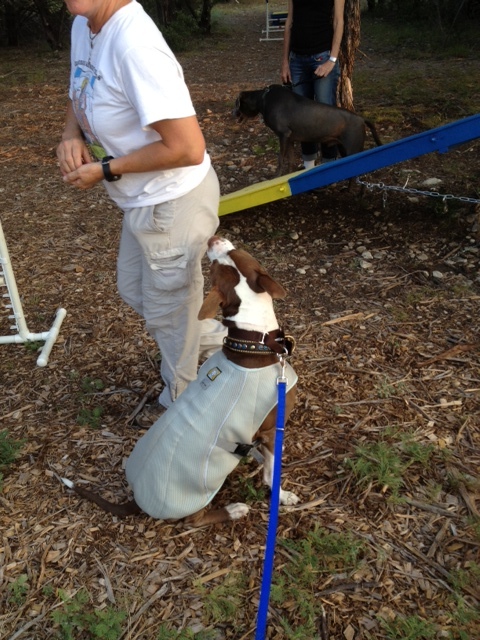 At tonight’s class, Doodlebug was ready to forget about all the other dogs right away. He put on his cooling vest (mama says he has to wear it because he has so many problems that he has to go to the Dogtor for all the time) and started hamming it up for the nice lady with the peppy attitude and the treats. What a dork he is! I, on the other hand, took a little while to find my groove. You see, even though Dude is newer at this whole learning thing than I am and I am a reformed reactive dog, he has had a lot more practice lately than me. 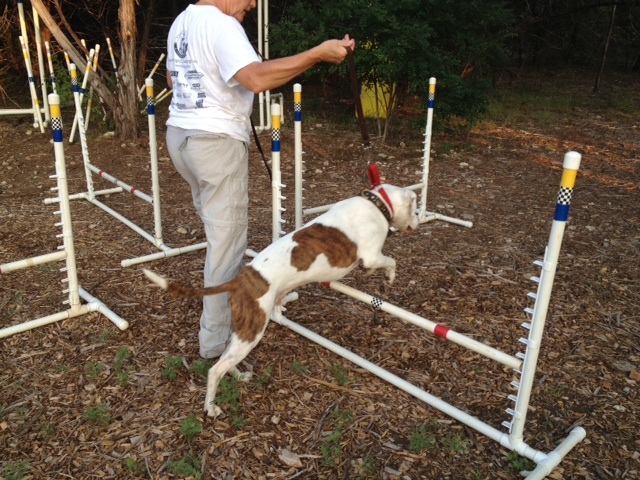 He has been going to the Center a lot and getting to play and work and practice around all kinds of other dogs. But me — I’m a little out of practice. So when we got there last week for the first time, I was a little bewildered! I took my time sniffing, peeing on stuff, and stone cold pretending the other dogs weren’t there. Until Dad got the squeaky toy. And then my worry was broken, and all I think was squeakysqueakysqueakysqueakysqueakysqueaky!!! And I leapt, and I bounded, and I ran across all those jumps so fast that dad couldn’t even get the eyephone to go “snap” fast enough to catch me. 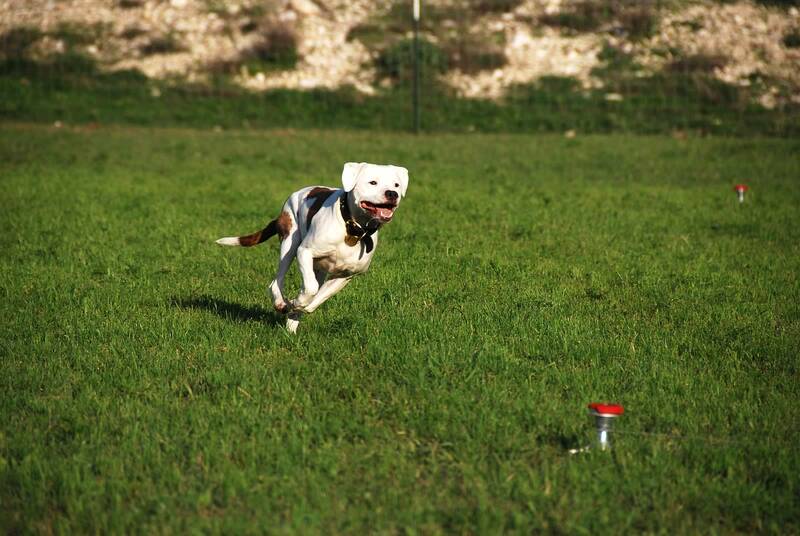 Check me out, running and jumping at the speed of light! Ok so then after we did all the jumpings, it was time to do the con-tacks. That means the things you walk on top of or jump on top of (rather than over and through them), I think. I like the “table” the best because you get to jump up on it and just sit there, and you get lots of treats and hugs. But I also like to do the kitty-walk. We walk toward it and dad says “walk it!” and I sashay like a supermodel, picturing myself on the runway wearing a fur coat made of kitty cats. Just look. Aren’t I glamorous up there, with my long supermodel legs and my beautiful, beautiful snow white furs? Well then it was time to do the chutes and ladders tunnels. You might think that those things are scary for a dog like me, and you would be right. But I promised dad that I would be brave, so I went in that deep dark tunnel! And you know what was waiting for me when I got to the other side? Dad! Again! With treats! 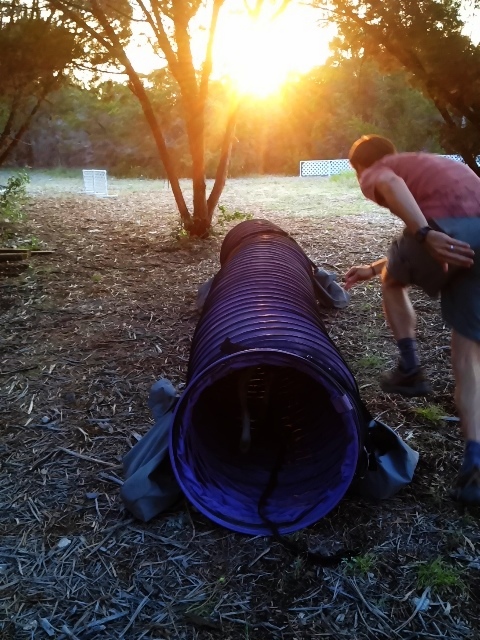 After those first few times, I started to have fun, running toward the tunnel with him, then racing him toward the sunset — him on the outside and me on the inside. 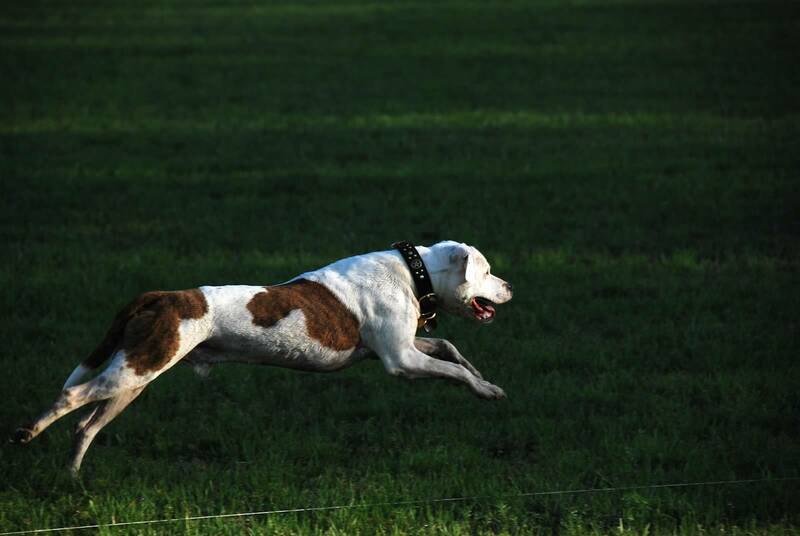 Just look how fast he has to run to keep up with my lightning-dog pace! Doodlebug and I can’t WAIT for next Thursday so we can go agilidogging again. It’s the most fun we have all week! Oh, and mama, we know the real reason you signed us up for agilidog class: you wanted to see which one of us boys is the better agilitator! Obviously, I am the better mathlete. But am I the better agilidog too? Check our blog facebook page to find out! Oh, hello friends! Is it Friday again? I’m so glad, because I have a secret to share: playing with toys changed my life. And I’m not saying that lightly, either. As a young chap, I was a very nervous dog. I didn’t usually know what I was supposed to do, and I had a lot of energy. I would often use it on chewing up things, baking, or redecorating mama’s apartment in my own Chicklet style. Mama thought it was because I was a very naughty boy, but in reality? I just didn’t know how to be calm! Then we went to training, and mama and dad were shocked that their first assignment was to play with me as much as possible. It was music to my ears! Mister Lee told mama that we should play as much as we can, but that she had to make the rules. She decided when it was time to play, when it was time to quit, and what the “terminal penalties” were. There were a bunch of reasons that Lee wanted us to play. It was good for our relationship and for me being able to trust mama, it was a good way to burn off some of my energy and help me be calm, and it was a positive outlet for my natural inclination to chase, catch, and bite things. By teaching me to play fetch or run a lure course, mama could say “here is your opportunity to chase and catch,” and “chase this ball, not that squirrel.” Mama says she can’t healthily control whether I chase and catch, but she can control when, how often, and what the subject is. I adore playing fetch and tug almost as much as I adore my mama and dad and brother Doodlebug, and that’s saying a lot. And lately I’ve discovered a brand new love that may be my most naturalest expression of my instincts: running the lure. The lure is a simluated rabbit chase course using a series of pulleys, a motor, some thin chord, and a real rabbit (although they say it’s fake, I just don’t believe them). 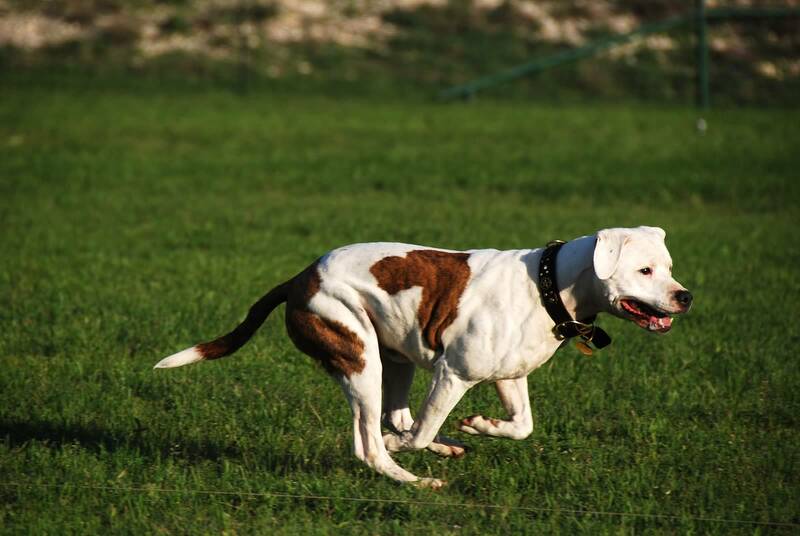 For dogs who love to chase small animals, it’s healthy, positive, controlled, rules-based, and awesome! 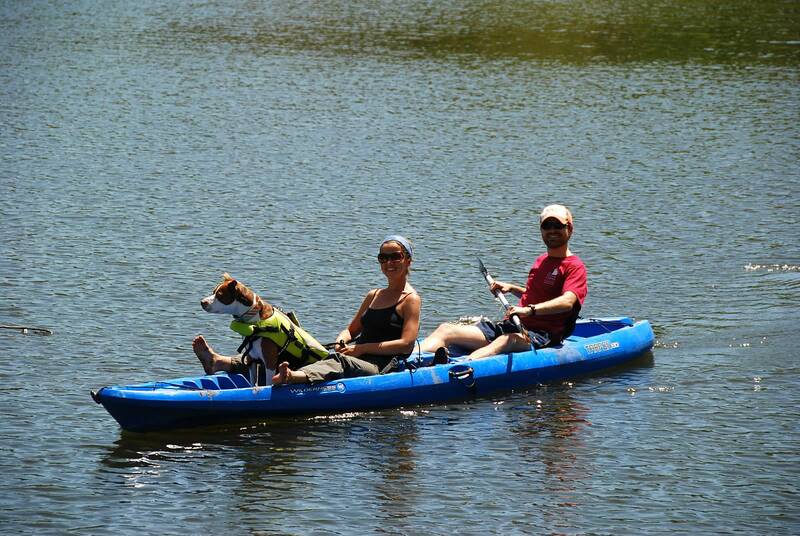 Dude and I have also been participating in some water sports with mama and dad lately. Water sports are different than chase and fetch games. They sure do tucker us out physically, but in a very different way. 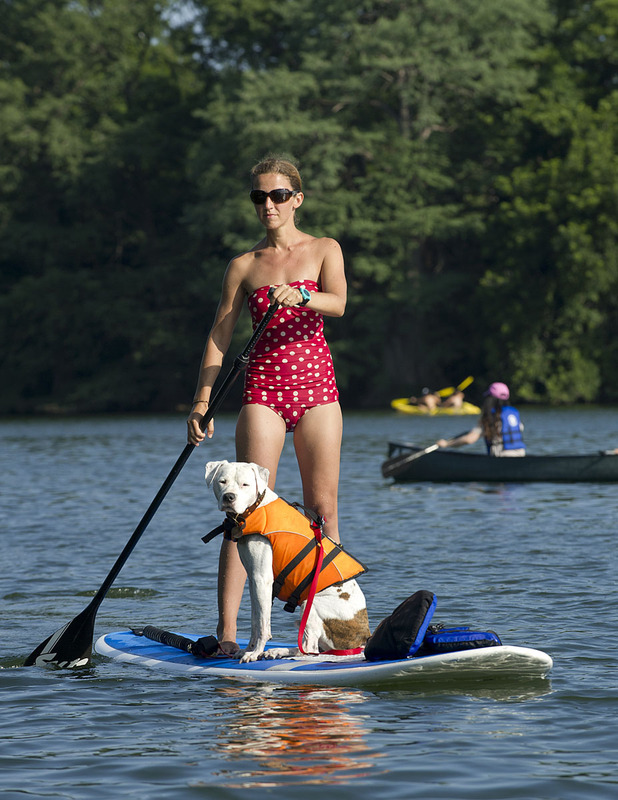 Kayaking and stand-up paddleboarding are balance games for dogs. They force us to be aware of the placement of our bodies, be careful how we sit or stand, and pay attention to the little muscles that we normally don’t notice — especially those of us who are anxious or reactive and normally focused on everything BUT our own bodies. Obviously, I make this look easy. But just try standing on a balance board for an hour and a half and see if you don’t need a nap afterward! A dog like me can run 10 miles and still be ready to party afterward, but put me on a kayak or SUP for an hour and I’m done for the day. The mix of physical and mental concentration and focus will wear me out like little else can. 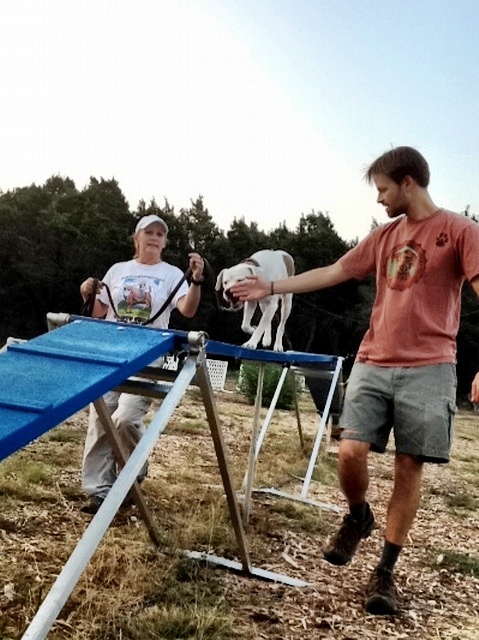 And there are so many other dog sports that folks in the know participate in with their dogs. Sure they’re fun for the owners and the dogs, but they provide a lot more than just something to do for a couple of hours every Saturday. Ever wonder why you see so many border collies on the agility field? Because they are very smart, high-energy dogs that need more than just a jog around the lake to help them chill out. 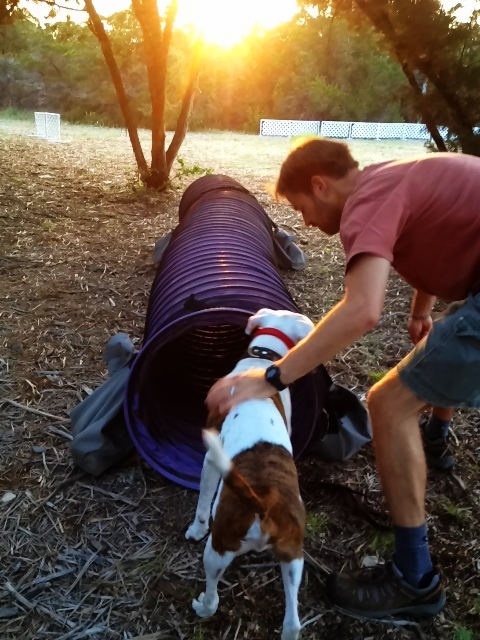 Sports like agility, weight pull, air scenting, and tracking are amazing for building dogs’ confidence, channeling their energy, exhausting them mentally, and helping them to relax around people and dogs – especially those who are worried or anxious, like me. Mama knows lots of dogs who are reactive, destructive, hyper, and irritable because they don’t know what to do with themselves. There is nothing wrong with them, they just need a job. Once they start to channel all of that energy into something challenging and positive, other things can fall into place! Have any of you had a transformative experience involving play or dog sports? Tell us about it! 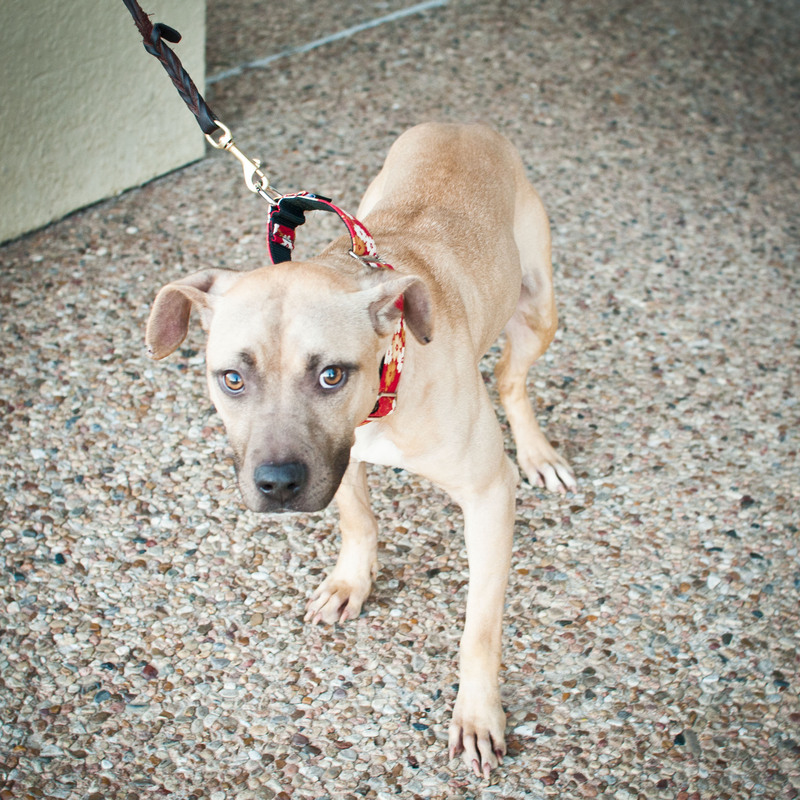 You encounter a shy, nervous, or fearful dog at the shelter or at an adoption event. You squat down, try to make eye contact, and encourage the dog to come to you. The dog doesn’t. She stays still, licks her lips, turns her head up and away, as though catching a scent in the air. She licks her lips. You move a little closer, thinking she’s just shy and maybe you should approach her instead of waiting for her to come to you. You scoot forward a step. She yawns. You pull out your baggie of treats, thinking that if she is worried about you, maybe you giving her a treat — a peace offering — will show her that you are friend, not foe. You hold the treat out on your hand. She stands up tentatively and creeps forward slowly, with a tiny, low wag to her tail. She grabs the treat and retreats. You offer another treat, she comes to you more quickly. The third time, she doesn’t retreat as far. You smile as you feel a little rush of adrenaline — You’ve won her over! Breakthrough! We’ve all been there, right? Offered super-delicious treats to frightened dogs, and then felt like a dog charmer when the dogs approach us instead of cowering at the back of their kennels? Of course. It seems natural and is so tempting to do, but could we be setting them up for failure? 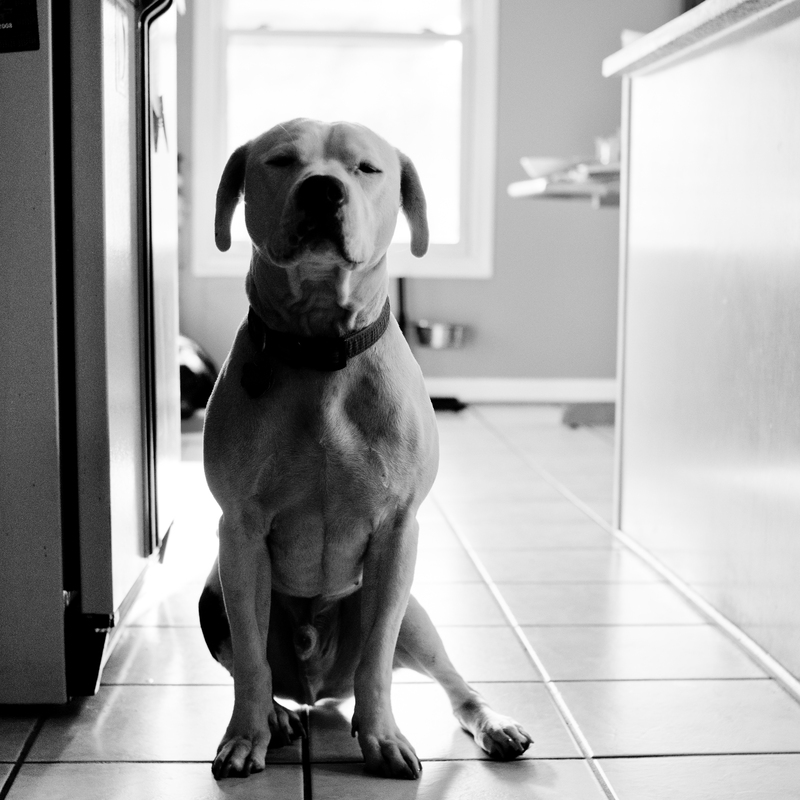 When we bribe a fearful dog to approach using treats, we are creating conflict in the dog. We are saying: Come to me even though you are scared of me. 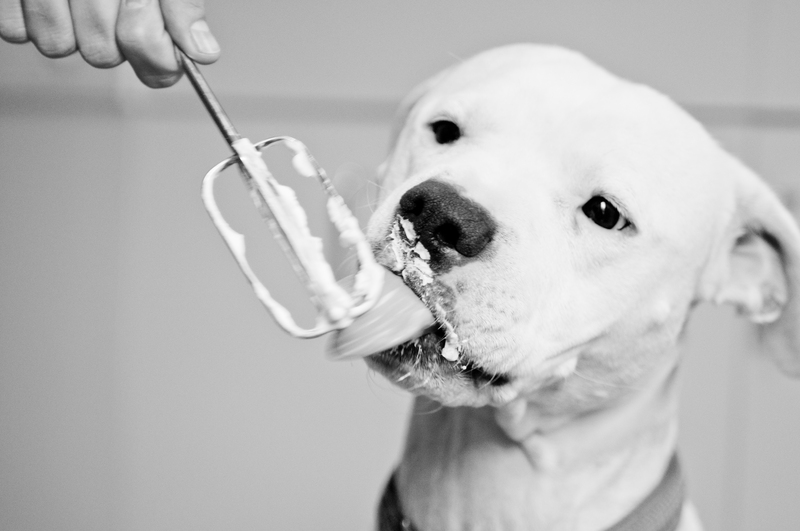 When this request is repeated over and over by different people, it creates a new habit in the dog — approaching people it is scared of in exchange for a food reward. The dog learns that it can approach, get a cookie, and then retreat. It’s when something unexpected happens — this particular stranger doesn’t have a cookie, and happens to sneeze, shuffle his feet, or stare directly into the dog’s eyes — the dog might bite. We can do fearful dogs a BIG favor by teaching them to stay safe when they are frightened: If you’re scared, don’t approach me. Stay where you are. If a dog understands that he has the choice of whether to approach a new person or not, that dog is much less likely to end up in conflict and in trouble. We want so badly to win fearful dogs over with food and love, but instead, let’s win them over on their own schedule. Some dogs warm up right away; others will never warm up. Some are somewhere in the middle. 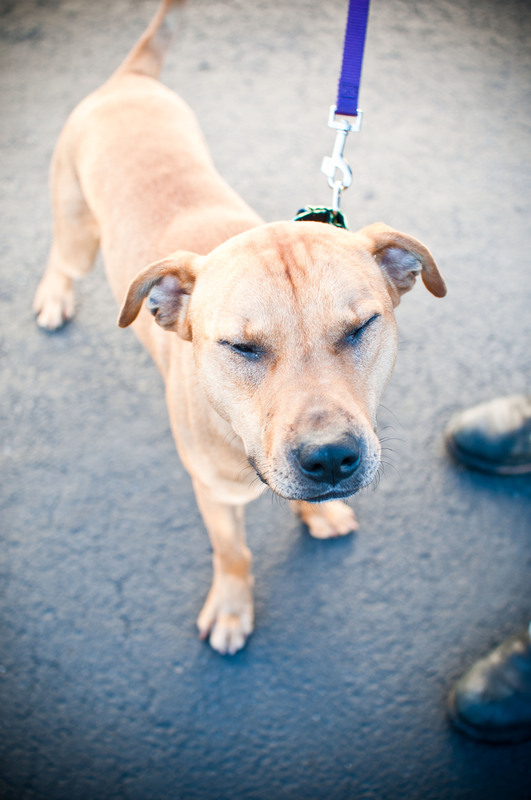 When meeting a new dog, pay careful attention to the dog’s body language. If the dog does not approach or seems worried as it approaches, just be cool and ignore it. Wait and observe. 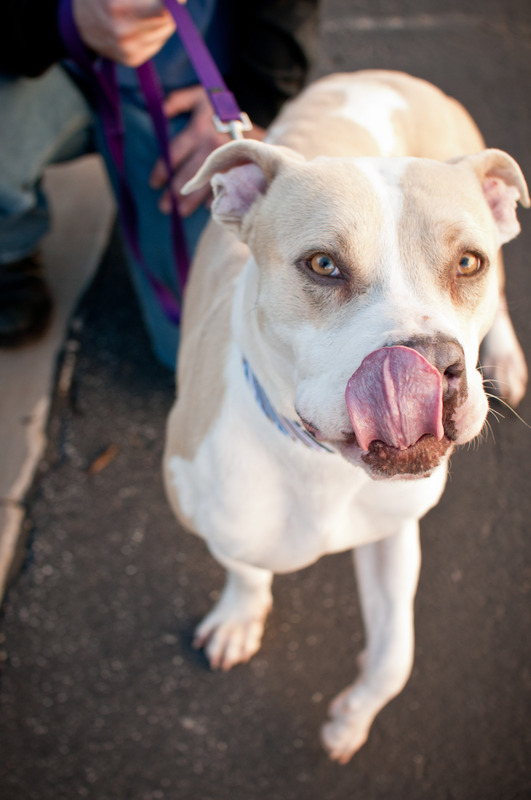 Look for calming signals (yawning, lip licking, sniffing the ground, blinking), and offer them in return. Take the dog for a walk or offer a toy, but don’t use treats or pet it before it is begging for your touch. Many dogs will eat or freeze for petting when they are nervous, but a dog is unlikely to play or actively solicit petting while it’s worried. After that barrier is broken, the treat bag comes out and a world of new possibilities opens up. But rather than using treats to win the dog’s trust initially, use casual indifference and patience. Teach it: You don’t have to come to me if you are worried. It’ll be the biggest favor you can do. DISCLAIMER: Author is a student of dog training at the Canine Center in Austin, not licensed professional dog trainer. Contents are one person’s observations, not written-in-stone best practice. Use at your own discretion!